Brentek’s DIN-102R Single-position DIN-mount I/O Rack offers convenient mounting and wiring of I/O modules. It has a universal socket hole pattern that accommodates all industry-standard Single and Dual I/O module types that are driven with open-collector driver circuits, TTL, and CMOS logic. 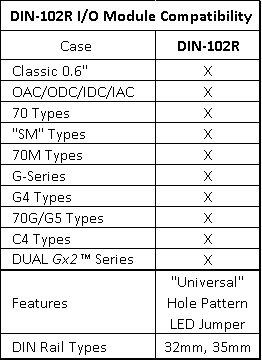 See Socket Compatibility Chart below for specific module compatibility. The DIN-102R snaps onto standard 32 or 35mm DIN rail, providing a quick and easy way to add a watchdog timer, input/output module or any other I/O functionality to a control system. Two points of I/O can be accommodated when Brentek’s Gx2™ High Density I/O modules are used. Industrial-rated full-size barrier screw-clamp terminals are provided for wiring connections, accommodating 12-22 AWG wire. When modules that do not have their own integral LED indicators (0.6” Classic, M, and SM series) are used, a jumper can be positioned to select whether the on-board LED is an ON indicator or OFF indicator. The DIN-102R-PDO is an optional configuration of the DIN 102R - its pull-down resistors have been removed, making it compatible with SOURCING LOGIC driven I/O modules. Sourcing logic is commonly used by PLC's. The DIN-102R is available from IPD, Inc. on Amazon. How to Purchase Customize It! Brentek is able to design what you need or package your design in standard I/O module packaging. Many custom modules have had first article units delivered in less than 4 weeks. Copyright ©2017 Industrial Products Distributing, Inc.
Minneapolis Web Design by AWS Media Co.